Oil from two of Russia’s biggest Arctic fields keeps flowing through the «Umba». The 300,000 ton tanker has become a key component in Russia’s oil exports through the Arctic. Less than two years after it was based in the Kola Bay, the «Umba» has handled ten million tons of oil, operator Gazprom Neft informs. 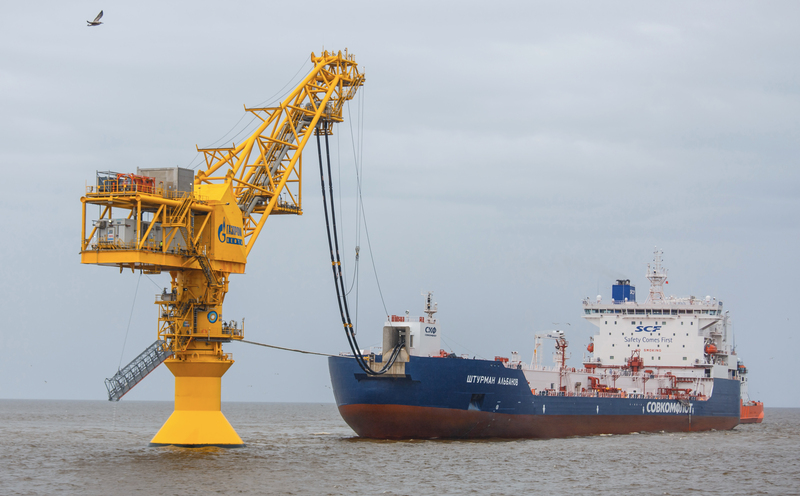 Ice-class tankers now shuttle to the floating terminal from offshore field Prirazlomnoye and new Yamal field Novy Port. In the Kola Bay, the oil is reloaded ship-to-ship to the «Umba», whereupon it is later picked up by bigger tankers destined to western European port, first of all Rotterdam. And traffic is due to increase significantly over the next years. While the Prirazlomnoye will boost output from 2,6 million tons in 2017 to an annual peak of five million tons, the Novy Port is ultimately to produce up to 8 million tons per year. Several brand new Arctic tankers are now involved in the trade. The 70,000 ton carriers «Mikhail Ulyanov» and «Kirill Lavrov» are designed for the Prirazlomnoye, while a fleet of six tankers are being built for the Novy Port. The first vessels of the new fleet, the «Shturman Albanov» and the «Shturman Malygin» were put on the water in early 2016. The third fleet tanker, the “Shturman Ovtsyn” set course for the history books when it in mid-winter 2017 left the yard of the Samsung Heavy Industries in South Korea, made it through the Bering Strait and sailed all the way to Yamal. The new Novy Port tankers have ice-protection standard Arc7 and are designed for icebreaking through the shallow water of the Gulf of Ob. They can carry up to 38,000 tons of oil. The «Umba» itself is ready for the bigger volumes. According to Gazprom Neft, the terminal tanker has the capacity to handle up to 15 million tons per year. The tanker was built in Japan in 2001 and previously carried the name ”Berge Kyoto”, ”Sarah Glory” and ”Sasa”. It has double hulls and classification AB. In early 2016 it replaced the «Belokamenka» which had served as Floating Storage and Offloading vessel for Arctic oil for more than a decade.